The Original Power Girl Returns? 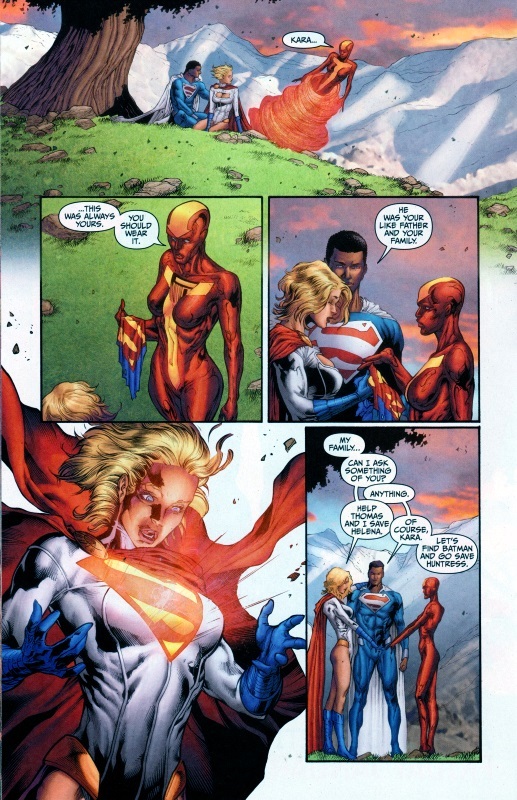 There’s an article over at Comics Nexus that appears to show the original pre-Crisis Earth Two Power Girl returning to the DCU, rather than the one that was featured in Worlds’ Finest and Earth 2: Society who was from the post New 52 Earth 2. Or it would, if they were the same character. The PG from Worlds’ Finest, Earth-2, Earth-2: World’s End and Earth-2: Society isn’t the same PG who is annoyed by the Star-Spangled Kid’s gift. 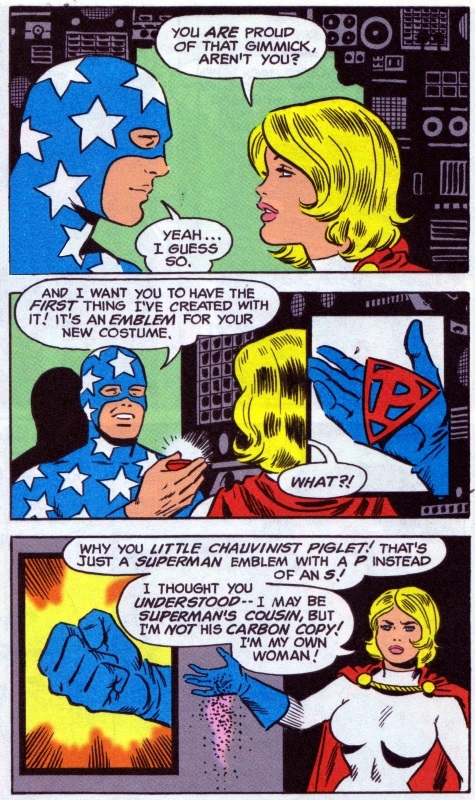 That Power Girl never fought alongside the Super Squad or the Justice Society, but instead had been Supergirl first on Earth-2. She only became Power Girl after being shunted to the Prime Earth following Darkseid’s invasion of Earth-2; when she and Huntress arrived, they found their new home already had a Supergirl, so Kara chose a new identity. 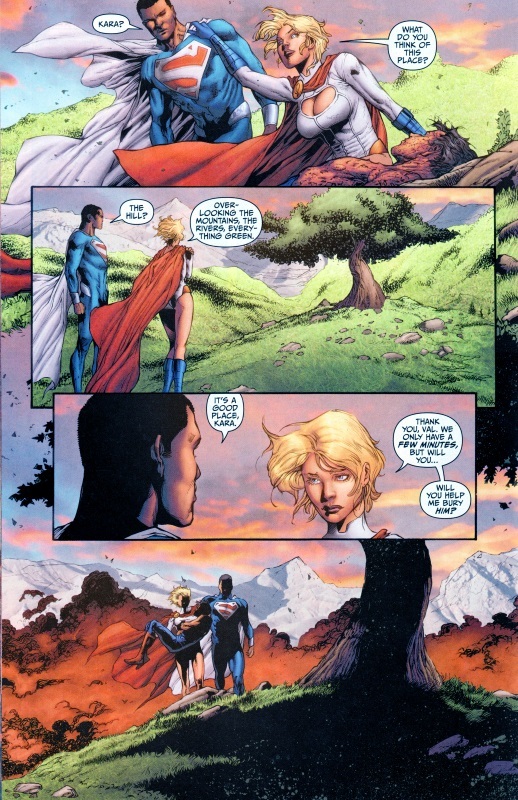 They eventually found their way back home to Earth-2, rescued the captured Superman who then died and, as shown above, his S-shield affixed itself to Power Girl, basically turning her back into Supergirl. Not only is the costume the same as the original’s, but the letterer even uses the font/logo from her 2009 – 2011 series (and if you haven’t read the first twelve issues of that series, you really should) Her series was her last appearance in the pre-New 52 world as the character that turned up shortly thereafter in Mr Terrific as Terrific’s girlfriend was revealed to be the Earth-2 version mentioned above. So is the Power Girl that’s trapped between worlds in Deathstroke Annual the original, pre-Crisis version? Having long been a fan of the character, I certainly hope so.